Jessi & I are once again teaching a finance class. This last week we hit upon a topic that I think is SUPER important. I told our students that if this lesson is the only one they remember, I consider the entire class a success. Make a meal plan, watch fewer movies, shop around for better service prices (phone, cable, insurance, etc), ride your bike to work. There are literally hundreds of ideas to save money, just to a web search if you need ideas. Remove credit cards from your wallet, pay with cash, set spending limits where you have to check with your spouse if it's above, use the service optoutprescreen.com to opt out of receiving credit card solicitations by mail (learn more). Start with a small weekly/monthly amount that automatically gets transferred ($10? $30? $100?!). Set a starter goal of $1,000 - this will get you through most 1-time emergencies. Define what "an emergency" actually is. Pay off student/car/home loans, save up to pay cash for a used car, save to buy a cabin/boat/home, retirement. I like this one because it's always inspiring! All four are tightly integrated. You can only reach your goals by spending less than you earn and avoiding debt. You can only build an emergency fund if you spend less than you earn. 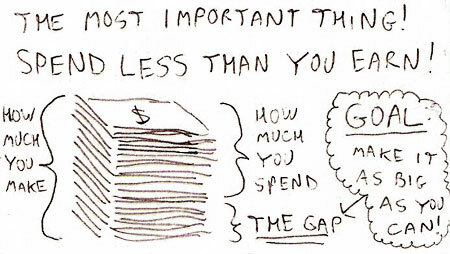 You'll decide to save money when you're working towards a goal. See? They all support each other. If one gets off quilter, the others will also suffer. When making changes, treat them like experiments: "Let's not eat out for a whole month as an experiment. If we hate it, no big deal." Make sure to set them for reasonable amounts of time - most often only a month or two. By treating it as an experiment, you'll be more willing to try something that's uncomfortable at first. So there you go. These are pretty basic, and if you master these it will change your financial future in profound ways. agree! Great advice, not complicated, very doable and very productive once implemented!